During the twentieth century there were countless innovations and revolutions in music composition and the very definition of music. During World War II, Olivier Messiaen pioneered new conceptions of musical time in his Quartet for the End of Time. Filled with reverence for God and meditations on the book of Revelation, Messiaen found it fit to include birdsong and explorations in color, two ideas that would permeate his compositional career. In Oiseaux exotiques, Messiaen replaced traditional scales and harmonies with the colors, rhythms, and shapes of birdsong. As a result of rejecting traditional limitations, Messiaen adapted natural patterns, such as those found in human speech, and traditional musical structures to bind his new material together in an understandable, relatable way. Likewise, he achieves communication in solo piano sections through the juxtaposition of musical events that convey information through their function within phrase architecture and those elements which communicate sensation and establish a point of repose and meditation within the work. 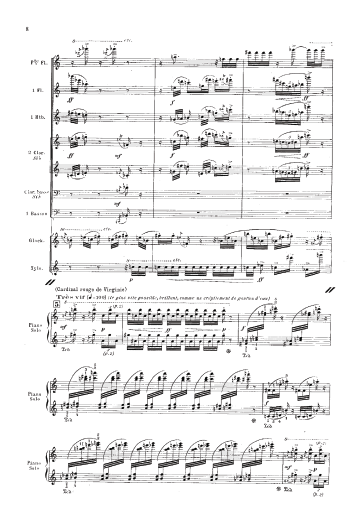 Musicology, history, linguistics, and biology collectively illuminate Messiaen’s compositional techniques and make the work more accessible to the average listener. In 1955, at the request of conductor Pierre Boulez, Olivier Messiaen used birdsongs, contrasted with strict Greek and Hindu rhythms, to compose Oiseaux exotiques, or Exotic Birds. Incorporating orchestral sections and keyboard cadenzas, the work resembles a piano concerto and was appropriately dedicated to and premiered by virtuoso pianist Yvonne Loriod. In Oiseaux exotiques, Messiaen “established that it was possible to create a successful musical work using birdsong.”1 Within both the orchestral sections and piano cadenzas, Messiaen constructs traditional phrase structures using transcriptions of forty-eight non-European birdsongs. I shall concentrate on his use of just four of these songs in that portion of Exotic Birds defined by rehearsal marks 4-5. From Sotavalta’s study, one may conclude that birdsongs consist of specific sounds that function at specific times. However, these units do not necessarily begin at the same pitch every time. Rather, individual birds recognize each unit by its melodic contour, and the overall contour or shape of the unit becomes the primary feature of Messiaen’s transcriptions.7 This focus on melodic contour enables Messiaen to accommodate orchestral instruments by augmenting the rhythm of the birdsongs, transposing octaves, and proportionally widening the pitch spectrum to eliminate quartertones and smaller divisions of pitch.8 Additionally, Messiaen characteristically emphasizes visual colors (i.e., the actual hues of birds) and their relationships to tone colors or timbres. In the preface to Oiseaux exotiques, he writes, “[The musicians] should not forget that this work is highly coloured; it contains all the colours of the rainbow, including red, the colour especially associated with hot countries—the colour of the American bird known as the ‘Cardinal.’”9 In Oiseaux exotiques, Messiaen tries for the first time to capture the timbres rather than simply the shapes of birdsongs by using his new “harmony whose ‘function’ is to realize the upper partials of the fundamental note of a song.”10 In terms of timbral intensities, he also attempts at least to suggest the hues of living birds. 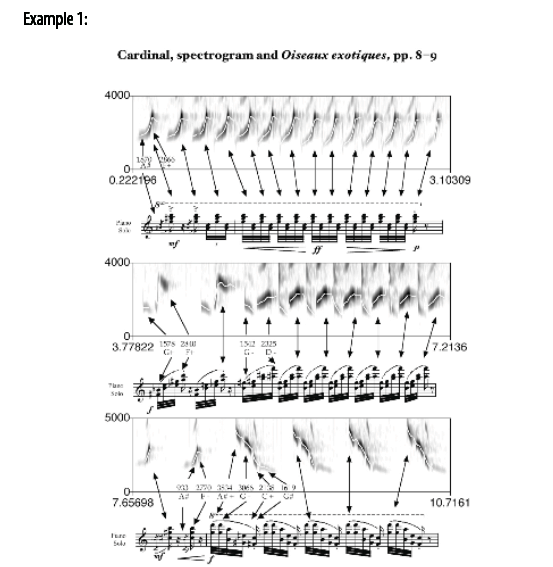 In Example 1 the spectrogram of a Cardinal is paired with Messiaen’s transcriptions in a piano cadenza of Oiseaux exotiques. Thus, rather than simply representing the shape of the Cardinal’s song, Messiaen uses abstract musical note clusters to portray simultaneously the timbre of the Cardinal’s song and suggest the vivid red of its plumage. Robert Fallon, “The Record of Realism in Messiaen’s Bird Style,” in Olivier Messiaen: Music, Art, and Literature, eds. Christopher Dingle and Nigel Simeone, 136 (Burlington, UK: Ashgate, 2007), http://www.oliviermessiaen.org/birdsongs. At rehearsal mark 4 (see Example 2), Messiaen divides the orchestra into four groups, each presenting and developing a different birdsong. The piccolo plays the song of the Lesser Green Leaf Bird, the glockenspiel represents the Red-billed Mesia, the xylophone portrays the California Thrasher, and the flute, oboe, clarinets, bass clarinet, and bassoon share the vocabulary of the Baltimore Oriole. These groups converse with each other as the birds they represent might. In the first measure after rehearsal mark 4, the piccolo and glockenspiel introduce a grace note figure that is common to all four birds’ songs. The Oriole and California Thrasher instrumental groups imitate the figure and continue their respective songs, which gradually become a single, more rhythmically dense motive. The Lesser Green Leaf Bird’s song moves faster, bringing the other three birds’ songs with it, and then has a brief solo statement. The conversation, layered in a way that allows each song to be heard clearly, continues. Eventually, the birds interrupt each other more frequently, increasing the sound density and energy until the final fortissimo leading into the piano cadenza at rehearsal mark 5. By layering the birdsongs to increase rhythmic density and the overall dynamic, Messiaen creates energy that propels the music forward. Messiaen also creates and releases tension through the layering of birdsongs and the interaction between the birdsong motives to create traditional and non-traditional musical structures. “Individual birdsongs co-operate as never before to project an overall textural or melodic shape.”11 In Example 2 from rehearsal mark 4 of Oiseaux exotiques, dynamic and orchestral density increases for the first two measures, relaxes for one, grows for two measures, then relaxes and builds steadily into the piano cadenza. This musical structure permeates Western music from the works of Bach to Mozart piano concertos to modern big-band compositions. Messiaen’s layering also provides textural shifts and interest in the form of non-traditional musical structures. “The interweaving of various birdsongs … forms a complex network of rhythmic and melodic material.… Messiaen avoids potential monotony in these works, which depend heavily on birdsong, but contrasts timbre and texture.”12 An extension of the impressionist works of Debussy and Schoenberg’s Klangfarbenmelodie, or tone-color melody, Messiaen’s birdsong motives weave in and out of their compositional framework, resulting to a considerable extent in development through timbral changes. In Example 1, measure 3, the clarinets, oboe, and flute drop out, and the remaining instruments, the piccolo, glockenspiel, and xylophone establish a brighter sound. This tone color is enriched and darkened with the entrance of the clarinets, oboe, and flute in the next measure; it is further darkened when the timbres of the flute and oboe are replaced by those of the bassoon and bass clarinet. Messiaen uses the birdsongs to create musical phrases and larger structures while manipulating the instrumentation and harmonic content to create a rainbow of actual and suggested (or symbolic) colors. * non-discursive elements, the tremolo figures, are highlighted. If the orchestral section discussed above can be considered a conversation, then the brief piano cadenza following it can be considered a soliloquy presented by the brilliant red Virginia Cardinal. 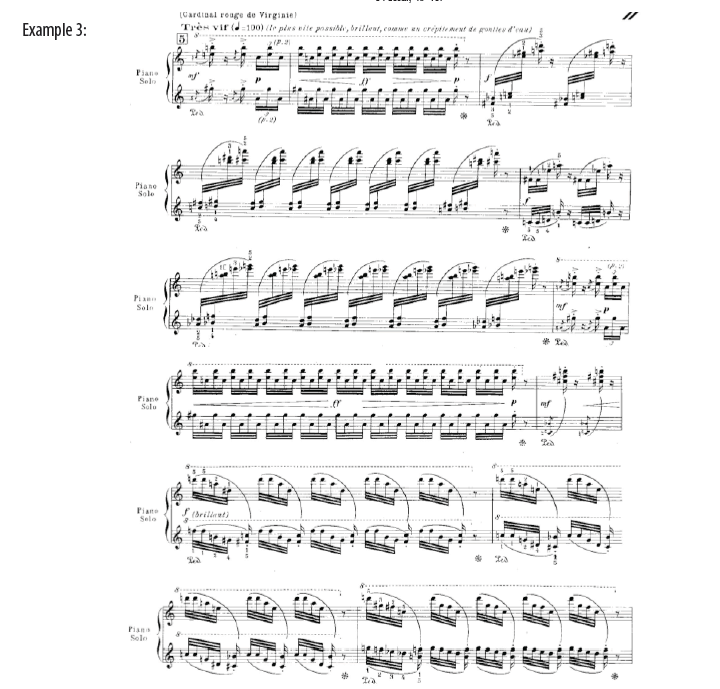 In this passage, the Cardinal’s song is non-syntactical, but Messiaen communicates meaning through the blending of discursive and non-discursive elements. According to Edward Pearsall in his essay “Anti-Teleological Art: Articulating Meaning Through Silence,” “Discursive elements in music are those that manifest themselves primarily as functional or purposeful transactions, whereas non-discursive events are those whose aesthetic impression is their prominent feature.”13 Pearsall adds that musical elements can only be defined as discursive or nondiscursive by their function and interaction with each other.14 In the piano cadenza that follows (see Example 3), Messiaen manipulates the song of the Cardinal, dividing it into three sections: a tremolo, a series of rising figures, and a series of falling figures. The rising and falling figures constitute fundamental antecedent and consequent phrases that establish an overall periodic shape or structure. These phrases and the period they establish can therefore be classified as discursive when compared with the non-discursive tremolos (highlighted in Example 3), which function as points of repose and provide color rather than structure. The non-discursive tremolos, however, are not devoid of significance. They do not communicate specifically recognizable musical ideas or provide structural coherence, referencing traditional phrasing like the rising and falling figures. Instead, the tremolos exist as sound itself, as timbral color; they communicate sensation more than information. The idea of color is central to the compositional technique and aesthetic of Messiaen, and the intense symbolic color of the Cardinal is central to this work. In addition to providing color, the non-discursive tremolos “[have] the effect of making room for the listener by opening up a broad indeterminate space for creative contemplation … inviting the listener to participate more fully in the creative process.”17 The tremolos in the piano cadenza engage the audience emotionally, connecting them to the music and creating an affective environment in which structural information is more effectively communicated. This non-discursive material aids in the understanding of the discursive elements, further demonstrating how both must necessarily coexist in order to communicate meaning. 1 Christopher Dingle, Musical Lives: The Life of Messiaen, (New York: Cambridge University Press, 2007), 145-46. 2 Christopher Dingle, review of Traité de Rythme, de Couleur, et d’Ornithologie (1949-1992) – Tome V, volumes 1 & 2, Tome VI & Tome VII, by Olivier Messiaen. Tempo: A Quarterly Review of Modern Music 58, no. 227 (2004): 43. 3 Olivier Messiaen and Claude Samuel, Music and Color: Conversations with Claude Samuel (Portland, OR: Amadeus, 1994), 32. 4 Romans 1:20 (New American Standard Bible). 5 Robert Fallon, “The Record of Realism in Messiaen’s Bird Style,” in Olivier Messiaen: Music, Art, and Literature, eds. Christopher Dingle and Nigel Simeone, 136 (Burlington, UK: Ashgate, 2007). 6 Dario Martinelli, Of Birds, Whales, and Other Musicians (Scranton, PA: Scranton University Press, 2009), 142-43. 7 Rob Schultz, “Melodic Contour and Nonretrogradable Structure in the Birdsong of Olivier Messiaen,” Music Theory Spectrum 30, no. 1 (2008): 89. 8 Robert Sherlaw Johnson, Messiaen (Berkeley: University of California Press, 1975), 117. 9 Olivier Messiaen, Oiseaux exotiques (Vienna: Universal Edition, 1985), X. 10 Peter Hill, ed., The Messiaen Companion (Boston: Faber & Faber, 1995), 409. 12 Robert Sherlaw Johnson, Messiaen (Berkeley: University of California Press, 1975), 123. 13 Byron Almén and Edward Pearsall, eds., Approaches to Meaning in Music (Bloomington: Indiana University Press, 2006), 44. 15 Peter Hill, ed., The Messiaen Companion (Boston: Faber & Faber, 1995), 406. 16 Almén and Pearsall, Approaches to Meaning in Music, 79. 19 Fallon, “Realism in Messiaen’s Bird Style”, 136. 20 Schultz, “Melodic Contour,” 135. 21 Messiaen, quoted in Orrin Howard, Oiseaux exotiques, http://www.laphil.com/music/piece_detail.cfm?id=947. Almén, Byron and Edward Pearsall, ed. Approaches to Meaning in Music. Bloomington: Indiana University Press, 2006. Ball, Malcolm. Birdsong in Messiaen’s Oiseaux exotiques. http://www.oliviermessiaen.org/birdsongs. Dingle, Christopher. Review of Traité de Rythme, de Couleur, et d’Ornithologie (1949-1992) – Tome V, volumes 1 & 2, Tome VI & Tome VII, by Olivier Messiaen. In Tempo: A Quarterly Review of Modern Music 58, no. 227 (2004): 41-45. Dingle, Christopher. The Life of Messiaen. Musical Lives. New York: Cambridge University Press, 2007. Fallon, Robert. “The Record of Realism in Messiaen’s Bird Style.” In Olivier Messiaen: Music, Art, and Literature, edited by Christopher Dingle and Nigel Simeone. Burlington: Ashgate, 2007; 116-36. Hill, Peter and Nigel Simeone. Olivier Messiaen: Oiseaux exotiques. Burlington, UK: Ashgate, 2007. Hill, Peter, ed. The Messiaen Companion. Boston: Faber & Faber, 1995. Howard, Orren. Oiseaux exotiques. http://www.laphil.com/music/piece_detail.cfm?id=947. Johnson, Robert Sherlaw. Messiaen. Berkeley: University of California Press, 1975. Marler, Peter and Hands Slabbekoorn, ed. Nature’s Music: The Science of Birdsong. San Diego: Elsevier, 2004. Martinelli, Dario. Of Birds, Whales, and Other Musicians: An Introduction to Zoomusicology. Scranton, PA: University of Scranton Press, 2009. Messiaen, Olivier and Claude Samuel. Music and Color: Conversations with Claude Samuel. Portland, OR: Amadeus Press, 1994. Messiaen, Olivier. Oiseaux exotiques. Vienna: Universal Edition, 1985. Schultz, Rob. “Melodic Contour and Nonretrogradable Structure in the Birdsong of Olivier Messiaen.” Music Theory Spectrum 30, no. 1 (2008): 89-137. Elizabeth McLain’s background is in music performance and musicology. Previously, Ms. McLain has studied performance interpretations of Shostakoich’s Lady Macbeth of the Mtsensk District,namely how a conductor’s musical, stylistic, and tempi choices can affect the audience’s perception of the morality and message of the opera, a project for which she received a VT CLAHS URI grant and about which she presented at the Virginia Tech Undergraduate Research Conference in the spring of 2007. Additionally, McLain received a research grant for her contributions to aforthcoming article on the James MacDowell-Templeton Strong letters. Ongoing projects include editing a biography of JamesMacDowell, formatting an English language collection of Liszt d’Agoult letters, and writing an article on the music of Andrei Tarkovsky’s films. In addition to her musical interests, McLain studies Russian and religious history, and has acquired a working knowledge of linguistic terminology and theory through her study of Russian, French, Italian, and Spanish. She will receive a B.A. in Music Performance and a B.A. in History from Virginia Polytechnic Institute and State University in May 2010.